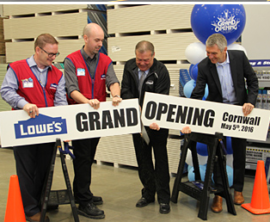 Cornwall Ontario – The Pommier family celebrates the grand opening of their newly renovated and expanded store this week. And like the quality jewellery the Pommier name is known for, the new store is a perfect blend of time-honoured beauty and innovative design. 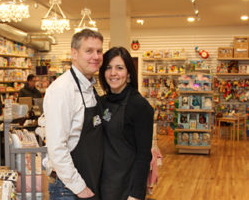 “We are absolutely delighted at how the store has turned out – and even happier to see the expressions on the faces of people as they walk into the store,” says Andre Pommier. Pommier Jewellers occupies a century-old two-story stone building at the iconic intersection of Pitt and Second in the heart of Cornwall’s Downtown District. The family has operated a jewellery store in Cornwall for over 7 decades. Following a two-year renovation effort, the new store features an open concept shopping experience with large bright windows allowing sunlight to sparkle off of the jewels within. The original cathedral ceilings have been restored, and original brick walls which were hidden for decades are now exposed. New lighting and display cases allow the heritage elements of the room – and the jewellery on display – to shine. One striking new element is a wood staircase that ascends to the second floor, which houses additional gathering space, effectively doubling the size of the store. The upstairs also houses a boardroom that is available to community groups and a new state-of-the-art goldsmithing workshop. The end result is an enhancement in the world-famous Pommier commitment to service excellence. “Tarah Zaczyk has joined our team as a second goldsmith, and we can now take care of jewellery repairs onsite, which reduces our turnaround time,” says Andre. Earlier this year, the Pommier family unveiled Pommier court, an adjacent courtyard featuring a large outdoor clock that chimes on the hour and can play seasonal music. With interior renovations now complete, the family is now ready to celebrate with an unprecedented array of promotions. On Thursday evening, the Pommier Family will gather for a ribbon-cutting ceremony and to light-up a massive 12 foot Christmas tree in the courtyard. It will kick off another two days of grand opening celebrations. Customers are invited to drop by the store on Friday for piece of celebration cake. The entire store (with the exception of Pandora) will be on sale and people can enter into a special draw for prizes. Each customer will receive a $25 gift certificate and the family has special gifts for kids. Pommier has also created a limited-edition replica of the Pommier clock in the courtyard. 100% of the proceeds of the sale of these unique clocks will go to the Cornwall Community Hospital Foundation. 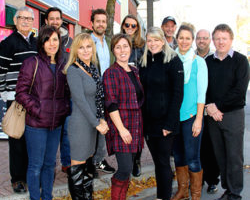 Scotiabank has stepped up to match all monies raised – up to $5000. Santa Claus will drop by Pommier Jewellers on Saturday and will visit with children from 10-2 outside in Pommier Square. Free photos will be available from 10 until Noon. Hot chocolate and TimBits will be available, and demonstrations by Tai Kwan Do and Zumba are planned. In the store, the celebration continues as Pommier launches “Red Saturday” – a special promotion destined to become a tradition. Any item in the store with a red sticker will be 50% off. All customers will receive a $25 gift certificate and can enter in draws. 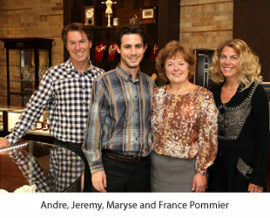 The renovation of Pommier Jewellers represents a $500,000 investment on the part of the Pommier family, and follows a $300,000 investment in 2012 for the courtyard. Design work was completed by Bob Pregent and Sean Lawrence Architect, and was carried out by Ray-Jans Construction, Aurele St. Jean Plumbing, Cornwall Interlocking Brick, CMG Innovation, Cornwall Gravel, Marc Allaire Electric, Todd Fenton, DemoPlus, Artisan Wood Design, Cornwall Concrete, Perkins Home Centre (RONA) , Emard Lumber, Marleau Mechanical, Casey Mechanical, RayJans Windows and Doors, Accessoware, Cornwall Lighting and Electrical Centre, Digirolamo Drywall, Sign-It Signs, Remax Cornwall, Vladi Kovinich, and Gib McIntee. The cost of renovations was offset in part by the Heart of the City Community Improvement Program.